Planning a camping trip for the whole family? If that’s so, you better make the most out of this experience. A camping trip is not only a great time for family bonding but also to teach kids basic skills. Much of the action during camping happens around the campfire and here, you can enjoy every moment when preparing food over the fire. Kids love this magical moment of making food over a fire and they will have indelible memories. If your kid asks, “how do I ace my homework during this trip?” tell them campfire treats will give them the energy they require. 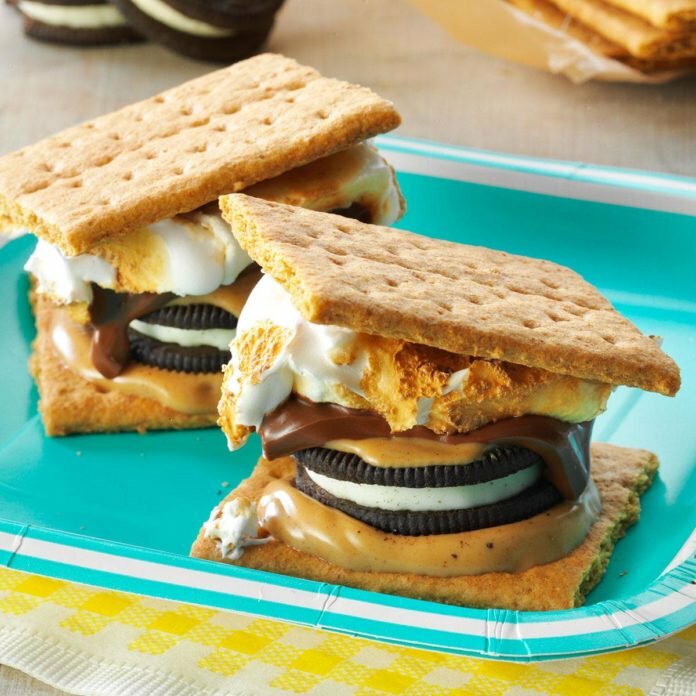 This article examines some easy campfire treats to give your kids a memorable time. Keep reading. Paper bag bacon and eggs: It is a lifesaver when you have no kitchen wear around and all you need are two strips of bacon, an egg, brown lunch bag, salt and pepper and a pointy stick for cooking the bacon over a fire. Campfire cinnamon roll-ups: You don’t have to skip your favorite morning snack and you only need a package of crescent rolls, 1/4 cup sugar, 1 tablespoonful cinnamon and wooden skewers for cooking over a campfire. Cinnamon Toast kabob: You need refrigerated biscuits, butter cinnamon, sugar and kabob skewers, nice and hot campfire. Brown bears: A favorite with kids during camping because they get to do some of the cooking. You need to carry biscuit dough, butter sugar, and cinnamon powder. Pigs in blanket: hot dogs, kabob skewers, crescent dough, and mustard. Wrap each hot dog with triangle dough strips and mustard and cook over the campfire. Pancakes: Kids always love pancakes and you can carry dry pancake mix and add eggs and water at camp and cook with a pan over the campfire. Apple bites: For a healthy morning snack, apple bites will do the trick. You need apples sliced nicely, peanut butter, almonds, walnuts, raisins, and chocolate chips. Ham, egg, and cheese bread bowls: This is an ideal lunch or dinner campfire treat and requires preparation of the bread beforehand. You also need slices of ham, eggs, finely chopped parsley and mozzarella cheese. Spider hot dogs: Kids love hot dogs and when split into layers, you can easily cook them over a grill at a campfire. Grilled Picnic Taco Nachos: They are messy but delicious and kids love them. You can have fun cooking them over a campfire. Campfire banana boats: If you plan to make a delicious snack from scratch, then look for an idea that your kids will participate in and this is where campfire banana boats come handy. Impossible quiche: the name might imply you can’t do it but with the right ingredients, you can make a delicious impossible quiche. You need eggs, chopped onions, milk, Bisquick, salt and pepper, butter and cooked sausage, chopped. These treats will make your camping trip memorable and your kids will never forget the experience. If you have an essay on camping recipes, you can go online and search “someone help me homework to find the best campfire treats.